Mary and I wish to thank all of you for the Christmas good wishes, including cards, emails, texts, phone calls and prayers. We had a wonderful Christmas being at St. Alban’s Cathedral, with beautiful Masses including great music by the organist and choir director, Rick Robinson and the Cathedral Choir. I had a number of reports from Clergy about their Christmas Masses and the attendance numbers were very encouraging. Often there are people who go to church once or twice a year that show up at one of the Christmas Masses. One never knows, however, if they fill out a visitor card, if it is worth following up. I remember meeting a lady who told me she had been driving past the church and seeing the sign for seven years. She finally decided to visit and was very enthusiastic about finding the church and stated emphatically she would be back next Sunday. Unfortunately, she never returned. Funny how that happens, but it is not always that way, however. Follow-up is critical, as I have maintained. God sends them to us, it is up to us to do our best to provide a way for them to stay. As we look forward to the events of the new year, one of the highlights will be the DEUS Synod this summer and the election of a bishop coadjutor. Following the canonical requirements for notification, our Chancellor, Glen Wieland, has provided a timeline for the timely request of approval from the other Bishop Ordinary, and the Standing Committees of all Dioceses to consent to holding the election. Requests for nominations will also strictly follow this provided timeline. Please watch for emails and in my next Bishop Epistle for critical dates in this process. The question in some people’s minds may be, why do we need a bishop coadjutor? Is the Bishop not well? Is he being pressured to retire? First, since I am the Bishop I can respond that I feel great and just got a clean bill of health in late 2018. No, I am not being pressured to retire. The point is, our Diocese is at peace, it is strong, unified and on the move forward. But nothing or no one lasts forever and we have a duty to make this kind of decision while we are in a state of peace and general good will. I do not plan to retire upon the election of a coadjutor, but will use what time I have to be a mentor and provide for the smoothest possible transition. But it will take all of us working together, with God’s help, to keep our Diocese strong and unified. We are at peace, strong, unified and on the move. Reports from a number of our very active parishes show growth with a number of new and younger families with children and in most cases do not bring baggage from their former jurisdictional experience. Without singling out particular parishes, the reason for growth can be attributed to many years of order and good will in the APA. It is not one bright hero priest somewhere, it is rather a number of good priests doing their jobs, loving their parishes, the APA and God. With a number of our new men coming from Seminary or transfer, the momentum is moving some of our smaller missions and parishes to renewed vision. We want the emerging leadership of our Diocese and Province to continue on what we have begun. Last week, January 15-16, 2019, the Presiding and Archbishops of the Joint Synods (G-4) met in Dialogue with the Prime Bishop and his Episcopal leadership of the Polish National Catholic Church (PNCC) and the Union of Scranton, in Atlanta, Georgia, at St. Barnabas’ Anglican Church. In October 2017, PNCC representatives were invited and attended the Anglican Joint Synods, now referred to as the G-4 Jurisdictions, which led to this invitation to meet with the Union of Scranton. The Dialogue was a friendly meeting which began with introductions, which allowed time for each jurisdictions to give a brief history of themselves. The Anglicans of the G-4 explained their origins and how after 40 years were finally united in full communio in sacris with each other. The Jurisdictions of the G-4 were represented by their Presiding and Archbishops from the Anglican Catholic Church (ACC), the Anglican Church in America (ACA), the Anglican Province of America (APA), and the Diocese of the Holy Cross (DHC). Also in attendance was a Bishop of the Anglican Catholic Church of Canada (ACCC). The PNCC Prime Bishop Anthony Mikovsky and Bishop Paul Sobiechowski gave a brief history of the origins and history of the PNCC. This included their dialogue with Rome, the Union of Utrecht, the formation of the Union of Scranton and their work with the Nordic Catholic Church. The PNCC was represented by three bishops and two senior priests. The agenda was well-planned and allowed time from the participants to get to know each other informally. In an historic moment during the Convocation, the Most Rev. Anthony Mikovsky, Prime Bishop of the PNCC, celebrated the Holy Communion, according to the rite of the PNCC, at the altar of St. Barnabas’ Church on Wednesday, January 16, 2019. This was the first time, that the PNCC Prime Bishop has celebrated the Eucharist using his own church’s liturgy at an Anglican Church. The Dialogue will reconvene in June of this year. This is the beginning of what will no doubt be a long process. It is important to understand there is no agenda to become one church. There is no intention of one jurisdiction absorbing another. The PNCC and the Nordic Catholic Church are from a different tradition from those of us who are Traditional Anglicans. The intent is to re-establish what existed between the Episcopal Church and the PNCC from 1946 until 1976 before TEC changed its Ecclesiology with the Ordination of Women to the priesthood. The APA was represented by me, as Presiding and Diocesan Bishop, along with Suffragan Bishop of the Upper DEUS, Bishop Chad Jones. Seminarian Creighton McElveen served as our scribe for the Meeting. The Conference was hosted at Holy Trinity Anglican Church, Fernandina Beach, Florida, by Father Brad Cunningham, the Rector. Each year our Conferences get better and this year was no exception. Fr. Brad arranged the schedule with the subject Foreign and Domestic Missions and How the Parish can be Involved. We had a wide range of speakers on subjects ranging from “The Benedict Option” and how it is perceived and working, to ministry with veterans in the community, to working with the homeless. This all led to some simulating discussion and a host of new ideas that could be replicated/modified in varying situations. We had contributions from clergy who have had a long-standing ministry to some who are in the early stages of ministry. All in all, it made for a quick moving day that kept everyone’s interest! Clergy and postulant wives were hosted by Diana Cunningham at the Cunninghams’ home for a luncheon on Thursday. The two days were made even more special at our worship sessions of Holy Communion and Morning Prayer, by having our musician extraordinaire, Father Greg Miller at the organ. And, it does the heart so good to have all the clergy singing with such enthusiasm. I want to give special thanks to our Board of Examining Chaplains who work so hard by coming to Conferences and Synods early and coordinating the efforts of training our men for ministry and our women for the deaconess program throughout the year. These Chaplains, under the leadership of Dean Mark Menees as Chairman, are gifted men who dedicate themselves to this critical work. We have wonderful men who have been giving themselves to the ministry of our church and they are receiving guidance, encouragement and direction from our DEUS Chaplains. They are also working with a number of our women who are in the process of becoming deaconesses. I also want to give special thanks to our clergy and laity that comprise our DEUS Standing Committee for their efforts and dedication including traveling long distances to serve on this important committee. I am pleased to announce the Committees approved three men for ordination to the Diaconate (see Ad Clerum section in this Epistle). As Required by APA Canon 43, all churches in the Province need to turn in their annual Parochial Reports (Jan. 1-Dec. 31, 2018) to their Bishop Ordinary. Deadline is March 1. All forms must be submitted online. The online format is similar to the type used for Clergy Conference Registration with quick question and answer entry. You may access the online form by clicking here. The online form will automatically send the parish data to the APA office and send a copy to the church email address used for submission. For DMA parishes, data will then be forwarded to the Rt. Rev. Robert Giffin, Bishop Ordinary, and for DOW parishes, to the Rev. Canon Robert Hawkins, Vicar General. I have never been more pleased and proud of the clergy we have in our church at the present time. We now have a number of our men in various stages of preparation for ministry, along with others who are now ordained and serving or preparing to serve in one of our parishes. There are other traditional priests who are looking at the APA as the church where they need to be. We are a stable jurisdiction which has a vision for the future. We are strong and positive in our outlook. I am so thankful for all of you who make this possible, clergy and laity alike. May this New Year be one of growth and prosperity in the Lord for all of us. 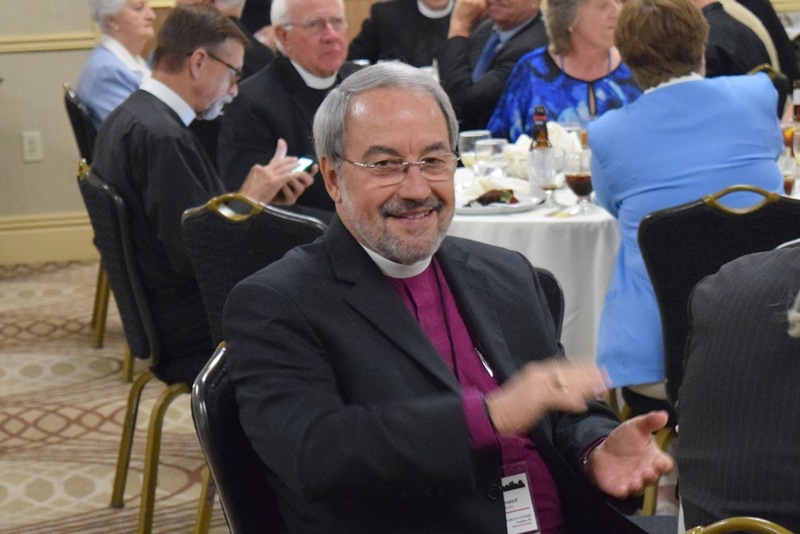 The Diocese of the Eastern United States, APA, will hold their Diocesan Synod in Orlando/Oviedo, Florida, the week of July 15, 2019. Online registration will be available here on the APA website on February 15, 2019. As mentioned previously, this Synod will include the election of a Diocesan Bishop Coadjutor. Also a Summons will be going out to all DEUS clergy separately. Reminder: all DEUS clergy are required to attend unless excused by Bishop Grundorf. I am pleased to announce that Father Brian Oldfield has been issued a call from St. Paul’s Anglican Church, Melbourne, Florida, to serve as Rector. Fr. Brian, his wife Morgan, and their two sons, will be relocating to Melbourne following the school year. Brian+ will continue to teach at Lindisfarne Hall School at Holy Trinity Church, Fernandina Beach, Florida and will be at St. Paul’s Church every other weekend during the transition period. This is the agreement established between Brian+ and the Vestry. The Area Dean, Fr. Ralph Waterhouse, is making arrangements with local clergy to supply St. Paul’s Church until Fr. Brian arrives in June 2109. Additionally, I am pleased to announce that Father Tyler Phass has been called to St. John’s Anglican Church, Greensboro, North Carolina, to serve as Curate to Dean Mark Menees. Fr. Tyler, his wife Holly, and their children will be relocating around March 1. Tyler+ served a brief curacy under Canon Ray Unterburger, before Fr. Ray’s untimely death in May 2018, and has served the balance of the year as Vicar. He will continue his curacy under Father Menees. Last but not least, Father Peter Joslyn, his wife Erin, and their two daughters (with a third on the way) will be relocating to Fernandina Beach, Florida. This is another exciting part of the story of our young Clergymen and their families willing to move where they can best serve in our Diocese as needed. Fr. Peter and family will be moving soon and he scheduled to start at Holy Trinity on February 17, 2019. Fr. Peter has been serving as Curate at St. John’s Church, Greensboro, North Carolina, under Dean Mark Menees, Rector, and will continue his ministry under Father Brad Cunningham, Rector at Holy Trinity Church, Fernandina Beach, Florida. The Board of Examining Chaplains (BEC) approved for Ordination to the Diaconate: Dennis Ryan of St. Paul’s Anglican Church, Crownsville, MD, and Kevin Fife, Seminarian at Reformed Episcopal Seminary (upon completion). Erik Wilson, who was previously approved by the Chaplains, was approved by the Standing Committee of the DEUS at this meeting. Congratulations and God’s blessing to these men. Canon Emerson and wife, Shirley; Fr. John Gibson; Bishop Rushlow; Bishop Hanlan; Bishop Shaver; Fr. Conway; Fr. Carter; Fr. Bakley and wife, Pat; and Fr. Gardner. RIP: Joan, wife of Bishop Raymond Hanlan. Dec. 11: G-4 Archbishop Conference Call. Dec. 19: Meeting with clergy re: possible Parochial school. Dec. 24: Christmas Eve Mass, St. Alban’s Cathedral, Oviedo, FL. Jan. 5, 2019: Meeting with clergyman re: retirement due to health. Jan. 12: Officiated Funeral of Joan Hanlan, wife of Bishop Hanlan, Deerfield Beach, FL. Jan. 13: Episcopal Visitation, St. Peter’s Church, Deerfield Beach, FL. Jan. 15-17: Anglican Joint Synods (G-4) – Polish National Catholic Church Dialogue Meeting, St. Barnabas Church, Dunwoody, GA.
Jan. 23-25: APA Winter Conference, DEUS Standing Committee Meeting, Individual Candidate Interviews, Holy Trinity Church, Fernandina Beach, FL. Feb. 9: Churchmen’s outing, Vero Beach, FL. Feb. 11-20: Pilgrimage to the Holy Land with the Anglican Province of America pilgrimage group. Feb. 24: Episcopal Visitation, St. Mary the Virgin Church, Delray Beach, FL. Mar. 9-10: Episcopal Visitation, St. George the Martyr Church, Simpsonville, SC. Mar. 26-28: Anglican Joint Synods (G-4) Clergy Retreat, Monastery of the Holy Spirit, Conyers, GA.
Jan. 23-25: DEUS Winter Clergy Conference, DEUS Standing Committee Meeting, Holy Trinity Church, Fernandina Beach, FL. Mar. 2: Attend ordination of Erik Wilson to the Diaconate, All Saints Parish, Wilmington, NC. Mar 30-31: Episcopal visitation, St. Augustine Mission, Valparaiso, IN. Jan. 21-25: Diocesan Board of Examining Chaplains Meeting, APA Winter Conference, and Diocesan Standing Committee Meeting, Holy Trinity Church, Fernandina Beach, FL. Jan. 27: Episcopal Visitation, Christ the Redeemer Church, Warner Robins, GA.
Feb. 3: Episcopal Visitation and Confirmations, St. Michael the Archangel Church, Matthews, NC. Mar. 2: Ordination of Erik W. Wilson to the Sacred Order of Deacons, All Saints Parish, Wilmington, NC. Mar. 3: Episcopal Visitation and Confirmations, All Saints Parish, Wilmington, NC. Mar. 17: Episcopal Visitation and Confirmations, St. Alban’s Church, Joppa, MD. Jan. 08: Southeast Florida Traditional Anglican Clericus, Delray Beach, FL. Jan. 12: Assisted, Funeral, Joan Hanlan, wife of Bishop Hanlan, Deerfield Beach, FL. Jan. 23-25: Winter Clergy Conference, DEUS Standing Committee Meeting, Fernandina Beach, FL. Feb. 12: Southeast Florida Traditional Anglican Clericus Delray Beach, FL. 20 The Most Rev. Walter Grundorf, D.D. Mea Culpa: In the last edition of the Bishop’s Epistle we missed the anniversary of Fr. Daniel Rieger’s priestly ordination on November 25. A belated blessings to Fr. Rieger. Please contact the APA Office at 407.657.0880 or 800.480.1087 or apadeus@cfl.rr.com if any of dates are in error or a date has been omitted.